No, it’s not time for Christmas decor yet. Leave those ornaments and reindeer tchotchkes in storage for a few more weeks until the tree trimming party. You can use that energy to decorate on Thanksgiving. Thanksgiving decorations were always overlooked in my family. With six children and more than 30 grandchildren and great grandchildren, the tables at my paternal grandmother’s house were always overflowing with food for the mid-afternoon Thanksgiving feast. The sight and smell of Mommy Edith’s sweet potato pie was enough to get the blood flowing. Our formal, dinnertime feast was always across Washington, D.C. at my maternal grandmother’s house. The meal took days in planning and preparation, but the choice of decor was usually limited to selecting the right tablecloths, serving dishes, and special occasion flatware from the buffet. Even though it was perfectly elegant, I can’t remember when we shifted focus to give the table a little sparkle beyond the home’s artistic interior. That’s why I’ve stalked down Pinterest so you don’t have to divert your attention from the food! Now you can grab a few ideas for your Thanksgiving table in between the searches for pie crust and side dishes. 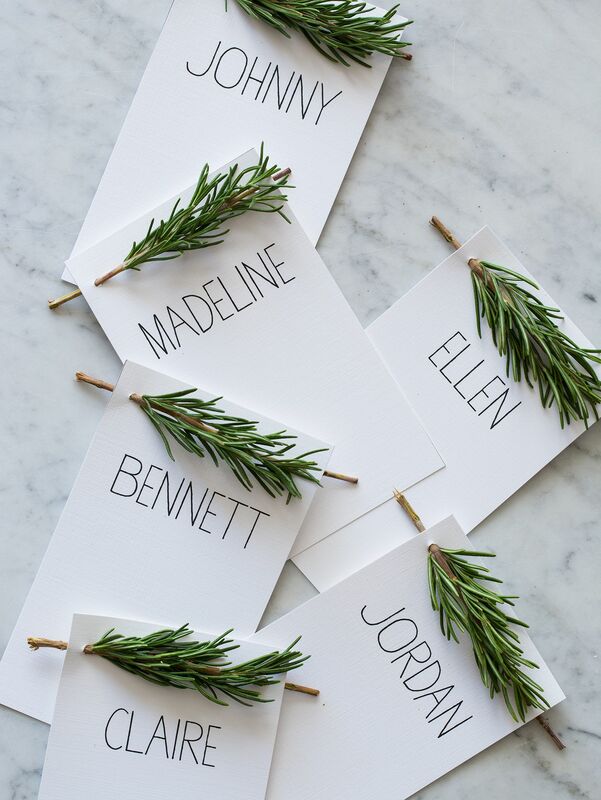 If you’re not the main chef this year, offer to help the host by taking care of the centerpiece, namecards, or place settings just like the special guests who would pop in to decorate Ina Garten’s dining table on Barefoot Contessa. You could be a major help without stepping on the wrong turf for the hectic holiday meal. I saw this on Horchow’s Facebook back in September and I’m still in love. Show off some of the seasonal ingredients that went into the meal while keeping them bright and fresh in the water. You’ll have another kind of leftovers the next day. Flowers, fruits and vegetables in fall’s colors here. You can still buy tomatoes at local farmers markets, but look around and find more produce that has lasted into fall. The tall candles add drama and make the spread look more formal. Berries, gourds, and a wispy branch. This table has a lot of drama but still feels very casual. Plus it would leave room for the mashed potatoes and gravy boat. A cute little pumpkin with a name card plus a ruddy oak branch in a vase. Why not take a walk in the park or backyard and pick up some leaves? Free decor. I think I’m doing this! 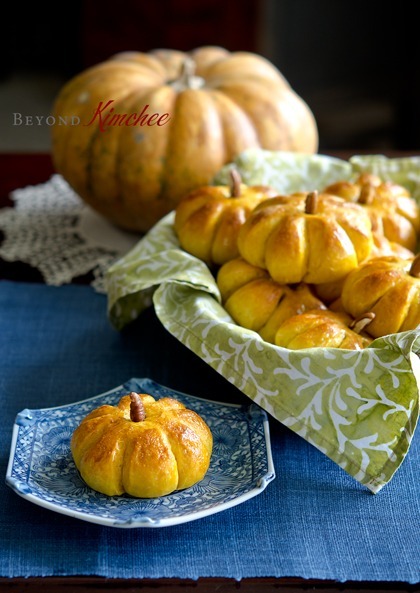 Adorable little pumpkin dinner rolls that you can leave at each place settings for guests’ arrival to the table. Just like the place cards above. This little pumpkin gets a decadent treatment with gold foil. Click through for the DIY instructions. Fall leaves are already pretty, but this one could be preserved and then hung on the Christmas tree. Hurry and finish a six-pack. 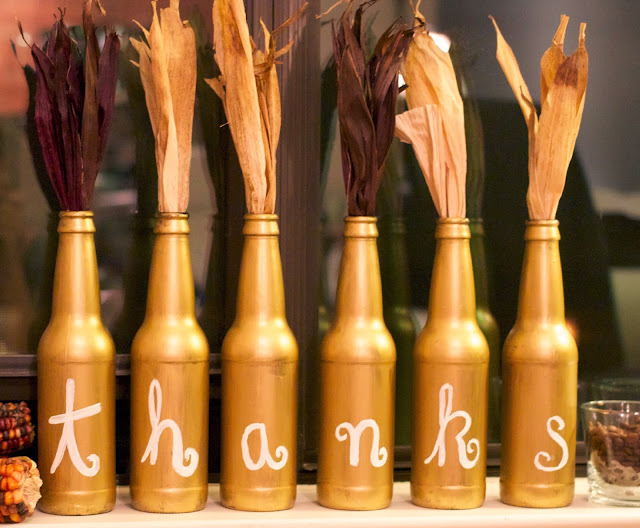 Use these golden bottles as vases for little flowers on the table or maybe even candlesticks. Click for the how-to. A little woody rosemary through two holes on a note card. Extra simple, smells great, and is basically free. You can design a nice table runner even without fine silks. I could also see a less minimalist approach with paints of different colors. If you’re using a colored tablecloth, try using white paper and green paint. The possibilities are endless. So that’s my roundup! 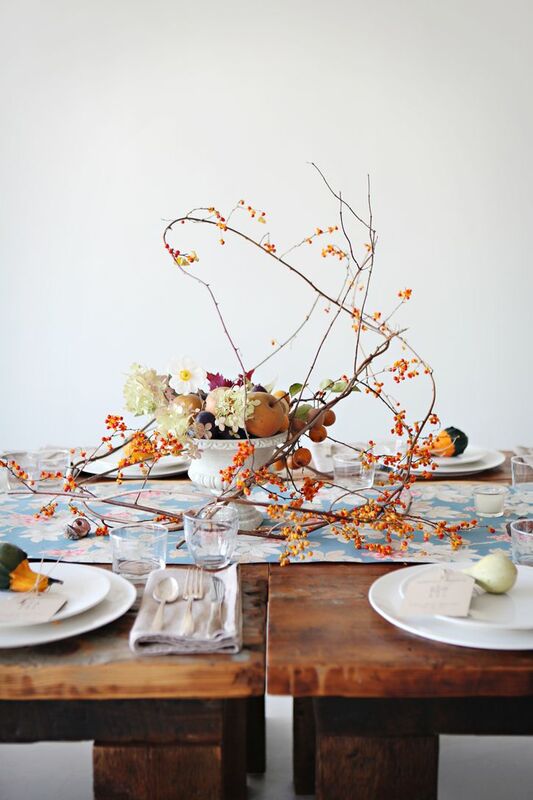 I hope your inspired to create a beautiful and delicious tablescape. Do let me know if you bring any of the ideas to life.